In the coming week, we’re going to be giving a few early small seasonal gifts to people, so with that in mind, we put the final finishing touches on our first gift basket, utilizing some of the items we already made. 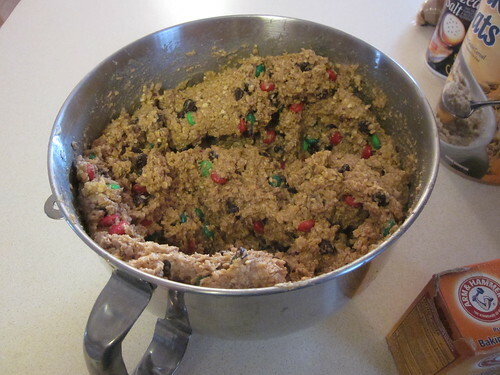 One component of many of our baskets this year is going to be cookies. Sarah is a spectacular cookie maker and she delightfully packages them up for people as well. 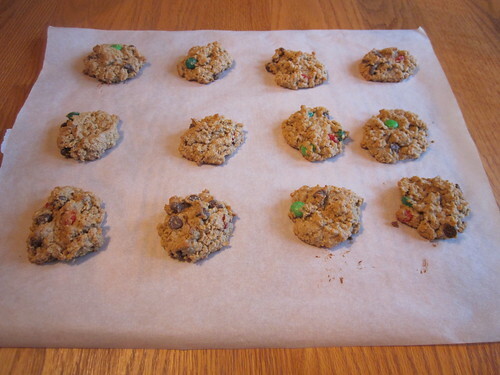 This year, she decided to use a peanut butter-based cookie recipe for her cookie bundles. In the picture above, Sarah is making cookies using tofu as an egg substitute – these actually turn out really well and were well liked by someone who thinks tofu is disgusting, so it works. Here’s what you need. Mix together the butter/margarine and the sugar. Then, add the eggs/tofu, vanilla, and peanut butter and mix until smooth. 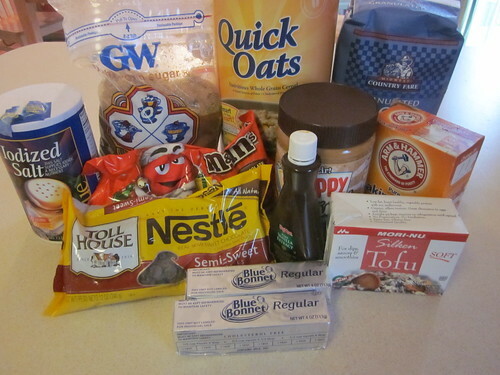 Add all remaining ingredients, then mix well. Shape into small balls (about the size of a golf ball) and place them on an ungreased cookie sheet. Bake at 350 F (175 C) for 8 to 10 minutes. They’re done when they hold together but are still really chewy. Naturally, we wanted to package these fairly nicely. Sarah’s simple solution was to take a large square of clear Saran Wrap, place three cookies in a stack in the middle, draw the Saran Wrap up around the cookies, twist the top, and tie it with a ribbon. Quite nice! Of course, you might want to just make big batches of these cookies for any family events and dinners you have coming up, either at Thanksgiving or at Christmas. 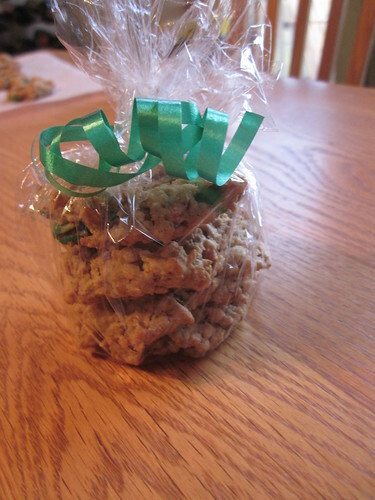 We wanted to give some of these cookie bundles away as part of larger gift baskets that incorporate other homemade gifts. Over the last few months, we’ve been searching a wide variety of supply stores looking for small gift baskets, eventually finding a large box of them for about $0.40 a basket. Here’s the basket we prepared. 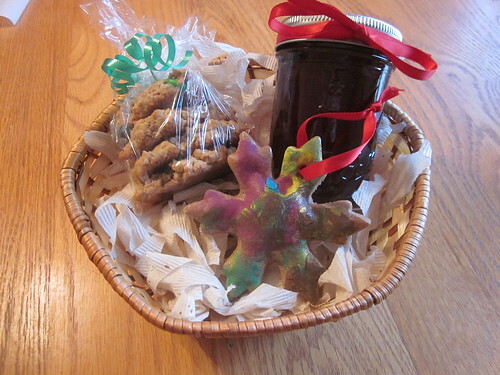 This basket contains a cookie bundle, a jar of the wine jelly, and an ornament hand-painted by our daughter (who likes blue and purple). It’s nestled on a piece of blank newspaper from our end roll. This is a small example of the gift baskets we’ll be giving out this year. Some will be larger and contain other items that we’ve made, and I’ll show you some of these later. This may be the last entry in the series. We may be making one more item – if we do, we’ll show it to you in two weeks. There will also be a final post showing some of the packaging that we’re using for these gifts.